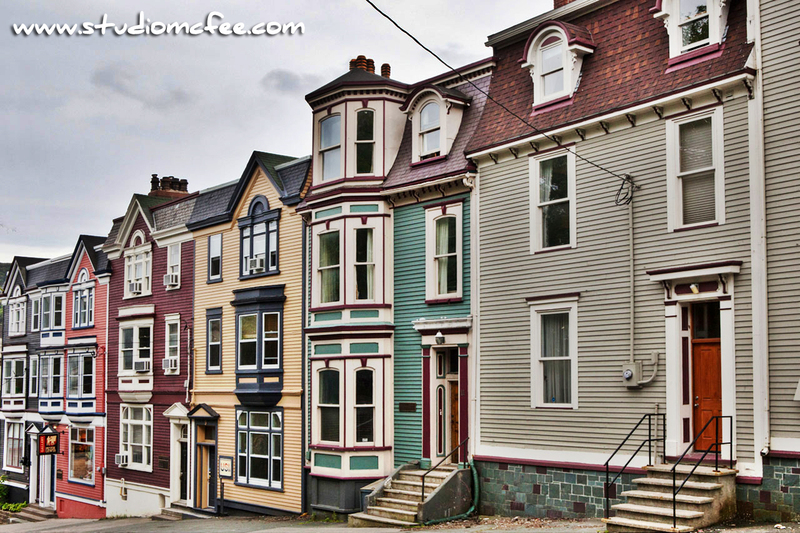 There isn't one 'Jellybean Row' in St. John's, Newfoundland. They're everywhere in the downtown area. 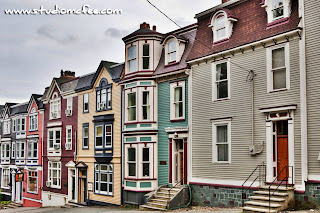 Brightly coloured Victorian row houses say "St. John's" like nothing else. Of course, Signal Hill also uniquely identifies the city. The photo above shows 'Jellybean' houses with Signal Hill and the mouth of St. John's Harbour in the background. Complete with gray skies, this photo captures some of the mood of the place. 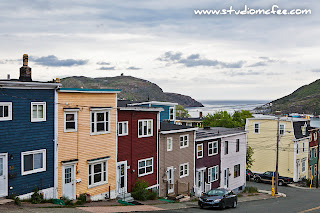 I spent two days in St. John's in mid-June. Both days the rain poured down. We got wet but it didn't dampen our spirits. We walked all over downtown, enjoying great food and traditional music at Rocket Bakery, talking to the proprietor of O'Brien's Music Store about button accordions, visiting The Rooms, learning about parking meter cards, and stopping traffic every time we stepped off a curb. In St. John's, even the slightest hint that you might be wanting to cross a street, will stop traffic in both directions. This is a wonderfully polite gesture but a bit unnerving for the first time visitor. I like it. It feels warm, friendly, and civilized but … that's Newfoundland for you.